PETALING JAYA: Malton Bhd has received overwhelming response for its latest high-end project, The Grove @ SS23, since it was opened for registration recently. It is understood that many of the over 300 registrants had booked some of the 35 waterscape villas. “We expect 70% of the 35 units to be taken up, leaving possibly only the bumiputra-quota units,” said sales and marketing director Tracey Lai. The prestigious gated residential development on the last parcel of freehold land in SS23 offers units priced from RM3mil. The main features include security alarm system with central monitoring option, CCTV at perimeter fencing, intercom system linked to the guardhouse, motion detector light, as well as jacuzzis. “The Grove revolves around a tropical garden living experience and each unit is adorned with harmonious water features and provisions for a feature lift. “Each home comes with two luxurious master bedrooms with jacuzzis,” Lai said. The show unit should be ready in the next few months. Malton has also engaged TID, a renowned international interior designer from Singapore, to add further value to the project, which is accessible through the Damansara -Puchong Highway, Federal Highway and North Klang Valley Expressway. The project would be completed ahead of schedule in 2011, like its prestigious Pearl Villas @ Section 16, which was sold out through private invitation, Lai said. On the property market, she said it was “challenging” due to the upheaval in fuel price and rising construction cost. She said The Grove not only clearly exemplified Malton’s strategic direction but also showed the company’s belief and confidence in the high-end property market despite the current economic uncertainties. Malton had always focused on product differentiation and branding, Lai said. KUALA LUMPUR: Malaysia needs to regain foreign investors’ confidence to spur the current property market, says Selangor Dredging Bhd (SDB) managing director Teh Lip Kim. “They feel insecure here because of the current political instability. Instead, they prefer to invest in other countries such as Singapore,” she said after a media tour of its Park Seven Residences at Persiaran KLCC. Sold out since early last year, Park Seven received its certificate of fitness for occupation on April 22. Teh said Malaysia still offered cheaper properties than Singapore and she believed the demand for niche market was still present. “There are still people with money in the market. When they want to buy properties, they become more selective. “That’s why SDB always believed in branding to attract them,” she said, adding that its on-going projects in Malaysia and Singapore would always focus on the niche market. “What makes us different from the other players is the concept that we introduce every time we launch our projects. “By doing that, we usually manage to sell 30% to 40 % more than our competitors,” she said. On the increase in construction cost, she said developers would have to pass part of the burden to buyers. SDB would be developing its land bank in Taman Melawati, Jalan Ampang, Damansara Heights and Petaling Jaya soon, Teh said. Mah Sing Group Bhd, a Malaysian developer, is considering a Vietnam venture valued at more than RM1 billion (US$310 million) for its first step overseas, as a faltering home economy slows the company’s sales. Mah Sing, which cut this year’s revenue forecast by half because of rising building costs and Malaysia’s slowing economy, is looking to expand across Asia to almost triple sales within five years to as much as RM1.5 billion. Its stock has tumbled 25 per cent this year, faster than the benchmark Kuala Lumpur Composite Index’s 22 per cent slide. Malaysia’s economy is stumbling as higher fuel prices weigh on consumer spending, Second Finance Minister Tan Sri Nor Mohamed Yakcop said August. 4. A 41 per cent increase in gasoline prices to trim fuel subsidies in June pushed inflation to a 26-year high, leaving Malaysians with less to spend. Mah Sing is exploring India, China and Indonesia, Leong said. Overseas sales will account for 20 to 30 per cent of the group’s total in the next five years, he said. The company is seeking revenue growth of 20 per cent each year, he said. Vietnam is Mah Sing’s priority as the “overheating” in its economy provides chances to buy land more cheaply, Leong said. “We won’t simply venture into a country without a good reason,” the Mah Sing CEO said. The company is examining a joint-venture to build homes on 300 to 500 acres of land in Ho Chi Minh City, he said. It may later build offices at a separate location there. Ong recommends buying Mah Sing, estimating its shares will rise to RM1.74 from RM1.44. The stock has slid 23 per cent since he started coverage with a “buy” rating, according to data compiled by Bloomberg. He has a “hold” recommendation on SP Setia Bhd, Malaysia’s largest property group, expecting its shares will decline to RM3 from RM3.14. Mah Sing is rated a “buy” by nine of thirteen analysts who cover the stock and SP Setia has a similar recommendation from 10 of 24 analysts, according to Bloomberg data. At home, Mah Sing plans to buy land that will generate gross development value of at least RM600 million each year, Leong said. He wants to bolster Mah Sing’s market value within five years to RM5 billion, which is more than SP Setia’s current worth of RM3.2 billion. 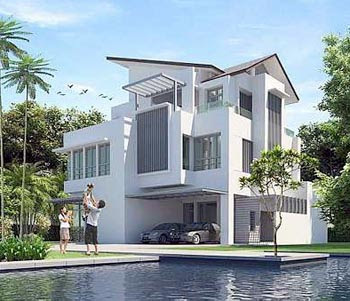 PROPERTY developer Country Heights Holdings Bhd has won two awards at the CNBC Asia Pacific Property 2008 event. In a statement today, Country Heights said its luxury properties — Country Heights Damansara and Borneo Highlands Resort — were chosen as four-star winners at the gala ceremony last month. “Both Country Heights Damansara and Borneo Highlands Resort clinch the coveted accolades after competing with the best property developments in Asia Pacific,” it said. Country Heights said the achievement would further strengthen its strong brand name as a leading and luxury green developer. “It is further testament and recognition of our approach to property development, which is to create masterpieces of luxury that embody love, style, nature, quality and excellence,” the company said. AXIS Real Estate Investment Trust (Axis REIT) is in talks to buy properties worth RM566 million as it seeks to boost the size of its portfolio. Out of that amount, it hopes to complete deals worth RM180 million by the middle of next year. By that time, its total property portfolio would rise to some RM844 million. The trust currently has 20 buildings worth RM663.89 million. "The current slowdown gives us an opportunity to add assets at attractive prices," its chief executive officer Stewart LaBrooy told a press conference yesterday. It will partly fund the purchases with money raised from the proposed sale of 120 million new units, which at current prices could raise some RM193.2 million. Part of the unit sales will also be used to settle its debt. "Our gearing is about 31 per cent now. We have two deals which are yet to be completed that will increase gearing to 35 per cent, and could complete the acquisition of two other buildings that will further increase our gearing to 41 per cent," Axis REIT Managers Bhd chief financial officer Lim Yoon Peng said. However, a softer market may make it difficult to raise funds. That is why Axis REIT decided to reclassify itself as a syariah-compliant REIT, from conventional. The reclassification will enable it to widen its investor base to include locally-based syariah funds as well as develop investor interest from foreign syariah funds. It could also attract investments from pilgrim fund Lembaga Tabung Haji and the Armed Forces Fund. This would make it the first office industrial REIT in the world to comply with syariah principles, LaBrooy said. It has appointed Abdul Raman Saad & Associates to conduct due diligence and help it comply with the necessary rules. It hopes to be syariah-compliant by the year-end. In the first half ended June 30 2008, Axis REIT's property income rose 37.6 per cent to RM30.1 million (from 17 properties) compared with RM21.87 million (from nine properties) in the previous corresponding period. Income after tax was RM18.62 million, up 47.3 per cent from RM12.64 million. LaBrooy also said that he hopes the government will announce the removal of the withholding tax for individuals investing in REITs in the coming budget. Malaysia imposes a 15 per cent withholding tax and 26 per cent tax on foreign investors and 20 per cent on institutional investors. In Singapore, there is no withholding tax on individuals and only 10 per cent tax on other investors. Axis REIT seeks to buy more assets worth RM560milKUALA LUMPUR: Axis REIT Managers Bhd, which expects to complete by year-end the acquisition of three properties worth about RM40mil, is eyeing another RM560mil worth of assets. Chief operating officer Stewart LaBrooy said Axis REIT aimed to expand its portfolio by RM180mil by the first half of next year and manage more than RM1bil in assets by end-2009. However, he declined to disclose details of the proposed acquisition. It also planned to acquire eight completed projects valued at RM320mil from private equity, he said. Axis REIT owned 17 properties worth RM651.4mil as at June 30, compared with 15 properties valued at RM608mil on March 31, he said. LaBrooy also said Axis REIT expected to complete by year-end the acquisition of three smaller properties valued at RM39.6mil, increasing its total assets to RM690.9mil. To reduce borrowings and finance more acquisitions, Axis REIT planned to raise RM200mil by placing out of 120 million new units, he said. “The placement is likely to be done in two tranches of 60 million units each. The first tranche will be in the fourth quarter of this year and the second in the second quarter of next year,” he said. On its proposed reclassification as a syariah-compliant REIT, LaBrooy said Axis REIT hoped to get Bursa Malaysia approval by next year. With the reclassification, Axis REIT hoped to widen its investor base to include local syariah funds as well as develop investor interest from foreign syariah funds, he said, noting that Axis REIT would appoint a syariah advisor to oversee the REIT's operations. On Axis REIT's wish list for Budget 2009, LaBrooy said he hoped the withholding tax would be removed to attract more investors to the REIT market. The current withholding tax rate for individuals and foreign institutions in Malaysia is 15% and 20% respectively compared with Singapore's 10% for foreign institutions. For the first half year, Axis' net profit rose 47.31% to RM18.62mil from RM12.64mil a year ago. MALEKI GmbH, a Germany-based building materials manufacturer, aims to generate revenue of euro100 million (RM508 million) in five years, as demand for environmentally-friendly building materials grows. "Our company is a start-up company. We have been around for more than a year and so far have sold little as our focus has been on product development. "But we are confident of generating a revenue of more than euro100 million within five years, based on our innovative technology," Maleki strategic director Matthias Gelber told Business Times in an interview. The company designs formulas for "green" cement, renders, protective coatings and self-levelling flooring compounds. "You can call our technology disruptive technology as I am convinced it will replace currently dominant technologies, such as epoxy floors for high performance industrial flooring. That's because our material is as good as epoxy, but better in terms of environment, health, safety and far cheaper to manufacture," he said. The company is in talks with local and foreign companies, mainly cement producers, on possible strategic tie-ups. These may involve the local partner mass producing the green building materials using Maleki's formula via a licensing agreement. This means the more Maleki building materials are produced, the more revenue it makes. "We are currently in talks with several major companies that want to license our technology. Talks are still in early stages. We hope something will materialise sometime next year," said Gelber, who declined to reveal the name of the companies. Interest in Maleki's products has grown over the last few months as more countries and companies are placing more emphasis on environmentally-friendly initiatives. "We are more environmentally friendly, have lower manufacturing cost and better product performance than currently dominating technologies in the market," Gelber added. KUALA LUMPUR: UEM Builders Bhd said that the scope of work awarded to it by Jambatan Kedua Sdn Bhd (JKPP), the company that owns the Second Penang Bridge, over-lapped with the scope of work being negotiated by its parent company, UEM Group Bhd, with the government. In a statement to Bursa yesterday, UEM Builders said that its parent company UEM Group Bhd (UEMG) was in negotiations with the government pursuant to an earlier decision made by the government to award the project to UEM group on a concession (build-operate-transfer) basis. “We understand from UEM Group that the government has not withdrawn its instructions to them (UEM Group). As this matter may result in substantive contractual consequences, we will seek clarification from the government. In the meantime, we are not in the position to comment further on this subject but will stand guided by the government’s decision,” said UEM Builders. Last year, the government awarded the Second Penang Bridge project to UEM Group on a concession basis. UEM group subsequently awarded the construction of the job to a joint-venture of Chinese Harbour Construction Company (CHEC) and UEM Builders with the former holding 51%. Both parties were supposed to firm up a shareholders’ agreement but could not do so as they did not see eye-to-eye on certain matters pertaining to the apportionment of cost. The Edge Weekly reported that the government has established JKPP to award the constracts direct to the companies and oversee the construction. It was reported that CHEC was awarded a RM2.3 billion job while UEM Builders got an award for a RM1.3 billion job, much lower than the estimated RM2.2 billion it was supposed to get. UEM Builders confirmed that had it received a letter from JKPP on July 30 informing that it had taken over the duties of the Special Task Force and offered certain works on the Second Penang Crossing Bridge project to UEM Builders.